Life for me here is like a long drawn relaxing isolated holiday. I enjoy staying home all day long ... toodling ard the house, doing some housechores (my fave has to be doing the laundry), listening to music, watching/listening to lots of drama serial while i do crafting. The day just whizzes by very quickly. Talking about drama serial, my favourite one at thism moment has to be this... 步步惊心. Its a China production with some hk actors. I was never a fan of china produced drama serials. My only memories of them were those which my dad would watch and fall asleep with. They are typically very dramatic in speech, slow and the setting is usually dark and gloomy. So, i was really impressed with this one especially. 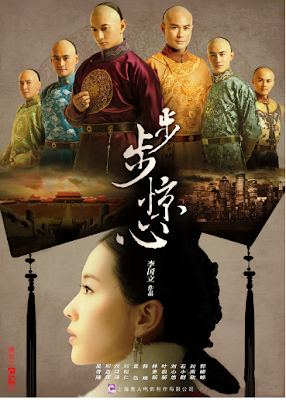 Unlike HK period drama which is a bit more 'modernised' already, China production period dramas are still very authentic in their props, fashion etc. Plus the storyline is sooooo good.. very romantic... *swoon*. The first few episodes are a bit boring but bear with it.. the story develops very nicely. it's my daily dinner companion - they show it on channel 8 at 7pm.